A rare collection of photos of "forgotten" World War One nurses have been transformed into colour in an effort to trace their identities. They were taken at Wrest Park in Silsoe, Bedfordshire, which is thought to have been the first wartime country house hospital. 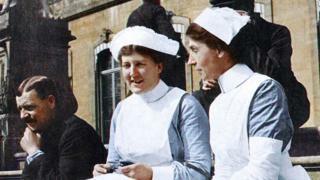 English Heritage, which now owns the building, said the women were the "backbone" of the military hospital and "deserve to be known as individuals". It ran as a hospital from 1914 to 1916. A fire forced it to close on 14 September 1916. As no formal records exist of the hundreds of nurses who worked and volunteered there, the pictures have been colourised by Marina Amaral and historian Dan Jones. Andrew Hann, English Heritage lead properties historian, said: "These women were the backbone of the hospital, and indeed the war effort, providing much needed treatment to the wounded, but also acting as a comfort to those soldiers traumatised by the horrors of war. "They worked tirelessly and deserve to be known as individuals, just as the soldiers they cared for do." Mr Hann said volunteer historians have been working to piece together information about the staff, but have now "hit a brick wall". "It would be wonderful if the public could help us identify these forgotten women," he added. Ms Amaral, who is a digital colourist, said: "Humans live in colour and this helps us see people from a more personal perspective - they are no longer removed from reality, but real people with lives and purpose. "These women did remarkable jobs during the First World War and if my coloured images help people recognise their family members then that would be an amazing outcome." The coloured photographs will be on display at Wrest Park from Saturday until the end of the month.